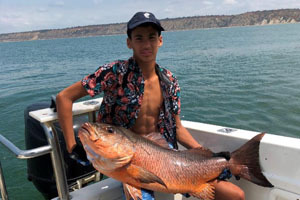 South African angler Vincent Sakko - age 13 - potentially set the new Male Junior World Record for African red snapper (Lutjanus agennes) with this impressive 11.7-kilogram (25-pound 12-ounce) fish that he caught on December 30, 2017 while fishing Barra do Cuanz, Angola. Sakko needed approximately 10 minutes to subdue the hard-fighting snapper after it ate the live mullet he was using for bait. If approved, the catch will replace the existing record of 9.2 kg (20 lb 4 oz). Malaysian angler Faizal Zainal potentially broke the All-Tackle World Record for giant snakehead (Channa micropeltes) with this massive 13.6-kilogram (30-pound) fish that he caught-and-released on February 28, 2018 while fishing outside of Rawang, Malaysia. Zainial needed only a few minutes to subdue the snakehead after it crushed the lure he was casting. If approved, the catch will replace the existing All-Tackle World Record of 11.79-kilogram (26-pound). IGFA Representative Steve Wozniak caught this gorgeous swallowtail (Meganthias natalensis) while deep dropping off Watamu, Kenya on January 25, 2018. Weighing in at 3.4-kilograms (7-pounds 8-ounce), the rare catch could earn Wozniak the new All-Tackle World Record if approved. 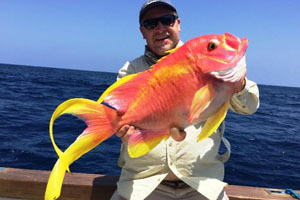 The current IGFA World Record for this species is vacant as this is the first-ever submission received for this species.